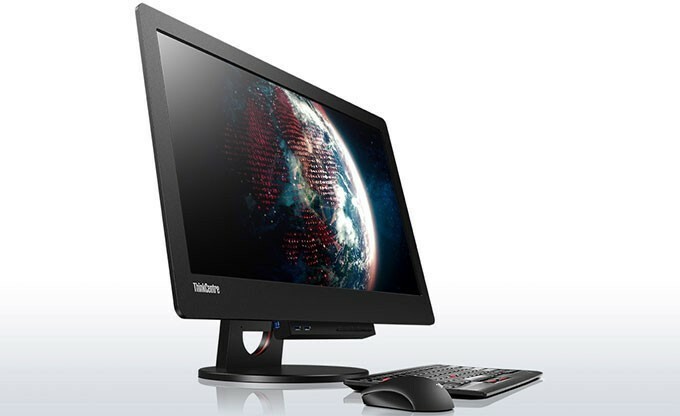 ThinkCentre® Tiny-in-One (TIO) 23" offers a full AIO experience with clean cabling and effortless setup. 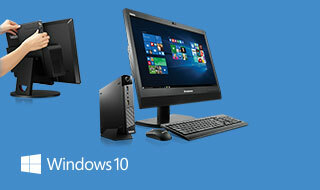 Compatible with all current generation ThinkCentre® Tiny products, TIO also delivers unparalleled configurability. Tiny is simply slotted into the back of the monitor which means CPU and monitor can be maintained and upgraded individually – no need to replace or repair the entire system. Perfect for large organizations and any space-constrained environment. The ThinkCentre Tiny-in-One (TIO) 23" is a unique modular All-in-One. TIO offers users unparalleled configurability. The TIO combines the versatility of a traditional desktop with the streamlined experience of an All-in-One (AIO). TIO comes with a range of optional accessories for comfort, allowing it to adapt to different roles and environments. TIO is designed to be simple to deploy - tool-less setup in just 15 seconds! Modular design means each component can easily be refreshed according to its own refresh cycle, yielding one of the lowest TCO of any 23" commercial AIO. TIO provides maximum flexibility while minimizing the cost of corporate refreshes. IT managers can easily change the display and computing modules separately, without having to upgrade the entire system as they would a traditional AIO. A single Kensington® lock secures Tiny and extension ODD box together for enhanced security. TIO is compatible with other data security features offered by Tiny such as Smart USB Protection and Bluetooth® lock. Space saving 23" modular AIO design. Versatility of a traditional desktop. Streamlined experience of an All-in-One (AIO). Easily deployed: Simple tool-less install. Fully functional ergonomic stand offering lift, swivel and height adjustment. *Minimum requirement is 2ND Generation Tiny – M93p, M83,M73 and M53 (with latest Intel® chipset Q87, Q85,H81, Bay Trail-D). A unique modular All-in-One with brilliant Full HD display. No messy cabling front-access USB and audio ports. Build the perfect AIO for your business with a choice of the latest Tiny products – M93p, M83, M73 and M53 (with the latest Intel® chipset Q87, Q85, H81, Bay Trail-D). Easy, tool-less setup in just 15 seconds. Modular design means each component can easily be refreshed according to its own refresh cycle, yielding the lowest TCO of any 23" commercial AIO. Fits anywhere with VESA-compatible mount. A single Kensington® lock secures Tiny and extension ODD box together for enhanced security. TIO is compatible with other data security features offered by Tiny such as Smart USB Protection and Bluetooth® lock. The ThinkPad Noise Cancelling Earbuds eliminate most ambient background noise through the use of active noise cancelling circuitry contained in a battery operated compartment. The ThinkPad USB 3.0 Secure Hard Drives offer high-level 256-bit Advanced Encryption Standard (AES) security within a slim, lightweight, self-powered, easy-to-use design. The Lenovo Universal All In One Stand is most flexible All In One stand on the market. It enables users to experience compatible Lenovo All In One PCs in a whole new way by offering rotating and adjusting height and a wide range of tilt. The ThinkCentre Extend Arm combines value and flexibility by helping you to free up valuable desk space and position your display for greater comfort and productivity. The sleek design allows you to extend, retract, tilt and rotate your LCD to an ideal viewing angle and position. To provide a seamless user experience, this new Island style keyboard is mirroring the same design, functions and technical specifications of the keyboard currently on our Thinkpad notebook systems. In addition the ThinkPad Compact keyboard incorporates scissor lift key mechanism to ensure great ergonomics and comfort. The Kensington MicroSaver® Security Cable Lock from Lenovo provides an extra level of security by physically securing your Lenovo notebook, desktop, flat panel LCD monitor or docking solution to a stationary object.